Plastic Nursery 1 Gallon - Plant Flower Pot - Green - 270 Pots By Growers Solution by East Jordon at Tulips Orchids. Hurry! Limited time offer. Offer valid only while supplies last. These thermoform Shuttle Pots are designed for quick de-nesting and dispensing. The pots are flexible while maintaining strength and durability. These thermoform Shuttle Pots are designed for quick de-nesting and dispensing. The pots are flexible while maintaining strength and durability. These pots feature a dark inner layer that prevents light from harming delicate roots. The dual level drain holes and footed bottom design facilitate better drainage. One full case of 270 One Gallon Green Shuttle Plant Pots. These pots are flexible for easy de-nesting. Dark inner liner that protects the delicate roots. The bottom of the pot is designed for better drainage. 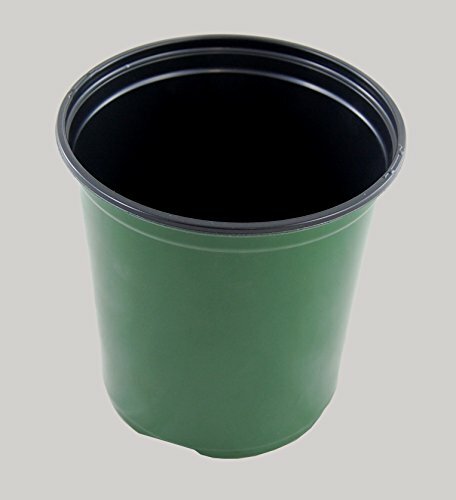 This round 6.30 inch by 6.37 inch deep pot is very durable and can be reused. If you have any questions about this product by East Jordon, contact us by completing and submitting the form below. If you are looking for a specif part number, please include it with your message.